Phoenix, Ariz. – John F. Long Properties (Jacob F. Long) and NOVO Development (Kurt Rosene, Justin Miller & Stephen Hulston) have completed a 25-acre land sale to Cives Steel Corporation, marking a significant launch for their CenterPoint Logistics Park in El Mirage, AZ. The 1,400-acre BNSF rail-served business park is designed for in excess of 25 million square feet of industrial, warehouse and manufacturing space. The Cives Steel Corporation plant at CenterPoint Logistics Park will be Cives’ 8thfacility in the United States. Phase One of the rail served site will be a 50,000-square-foot, pre-fabrication facility employing 50 workers. Phase Two will be 100,000 square feet and employ approximately 150 additional workers. Cives Steel Company is a national leader in structural steel and plate fabrication with facilities strategically located throughout the United States. The company has been in operation more than 60 years and the El Mirage facility will focus on products serving the Southwest. “The City recently completed full improvements to El Mirage Road, creating easy access to the Northern Parkway, and this year will begin similar improvements to Dysart Road. 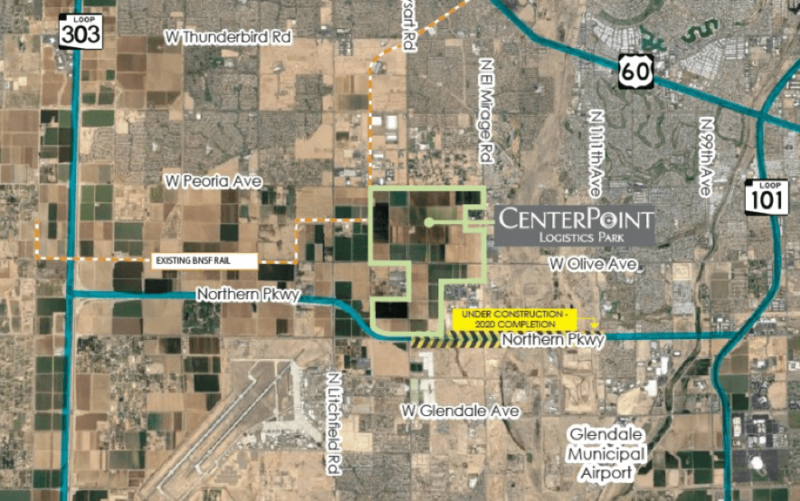 These improvements, along with the existing westbound connection of the Northern Parkway west to the Loop 303 freeway and the under-construction, eastbound connection of the Northern Parkway to the Loop 101 freeway make CenterPoint an ideal location for future industrial development.” says Miller. CenterPoint Logistics Park consists of 1,400 acres zoned for industrial use. The master planned park is owned by the John F. Long Family Trust, which has teamed with NOVO Development as their preferred developer. The park spans from Peoria Avenue on the north to the Northern Parkway on the south and from Dysart Road to the west to El Mirage Road to the east. The property is rail served by BNSF and is approved as a Foreign Trade Zone. The Northern Parkway runs along the southern boundary of the property and will soon extend across the entire southern end of the park with two full diamond interchanges providing access to the park. Rail service is being further extended inside the park and will create more than 300 acres of rail-served land. Available sites within CenterPoint Logistics Park range from one to 500 acres. The park is being marketed to users ranging from small, local companies needing their own facility, to major corporations with requirements of a million square feet. Pat Feeney, Dan Calihan and Rusty Kennedy of CBRE serve as exclusive sales agents for CenterPoint Logistics Park. NOVO Development, LLC is a commercial real estate development company headquartered in Phoenix, Arizona. The company develops a wide variety of commercial real estate projects ranging from: Office; Industrial; Medical; Multi-Family; and Student Housing. If you would like to learn more about NOVO Development, visit www.novodevelops.com.